NY Law School Symposium “Sharia in America” Day 2-Sadiq Reza | the "silent" majority no more! Day 2 – Aug 26, 2011- 8:30 AM to 6:30 PM. This is Part 1 of 10 audio posts. 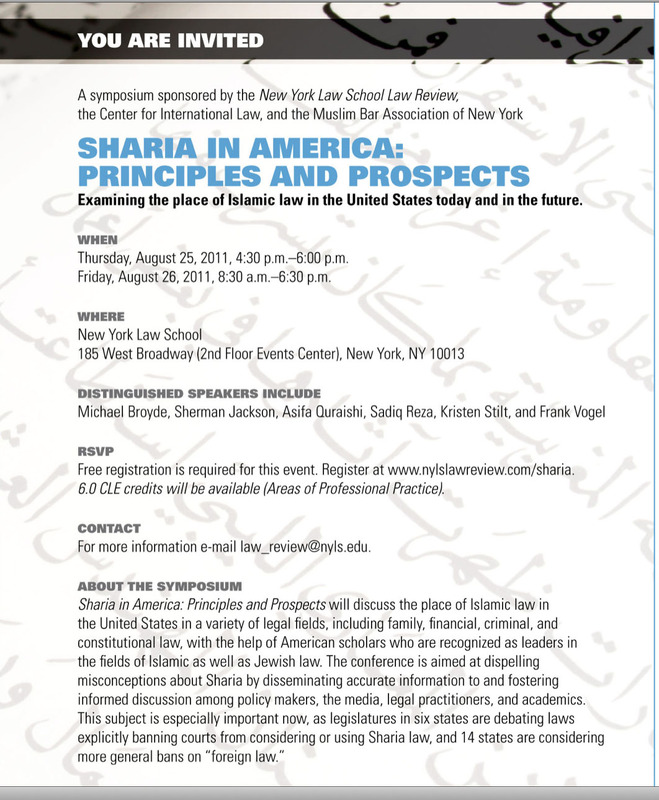 It was an 8 hour Symposium hosted by NY Law School Law School Review on “Sharia in America:Principle and Prospects” to examine the place of Islamic Law in The United States. As we approach the 10th Anniversary of 9-11, this symposium was primarily a two-day commercial for Islam. Take Heed. A few minutes late, I picked up the opening remarks of Professor Sadiq Reza, of New York Law School. 1. Sharia is God’s Law. A Religious Government Law for a majority of Muslims overseas. 2. Vogel has trolled the Internet looking for the alleged Calls-for-Sharia in U.S. Claims he can’t find anyone doing this. A slide show of Glossary that Sadiq Reza mentions (and graphs) is in Flickr( with three other slide shows) where you’re able to enlarge the pictures to any size for better reading. NEXT: Part 2 (Day 2) Professor Frank Vogel of Harvard Law School spoke again (briefly) on the History of Islam/Sharia (with slides) Spoke about 19 minutes. Then took two questions before the symposium continued (Part 3) Professor Michael Broyde (Emory University Law School) on Jewish Law. 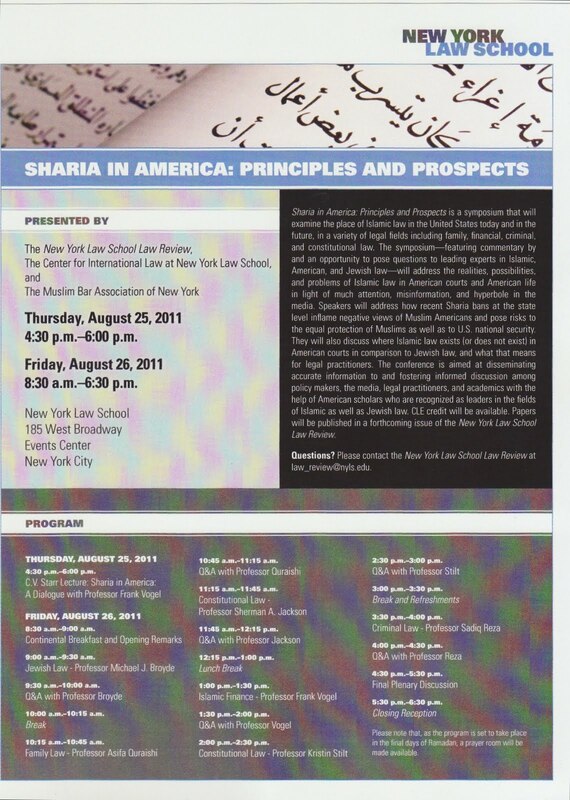 Pingback: NY Law School Symposium-”Sharia in America: Principles and Prospects” (Part 1) | the “silent” majority no more! Pingback: Sharia Lawfare came a-knockin’ … and we Let It IN …. | the "silent" majority no more!